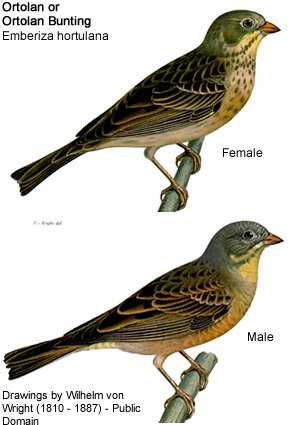 The Ortolan or Ortolan Buntings (Emberiza hortulana) are tiny finch-like songbirds that are part of the bunting family. These tiny birds occur naturally over most European countries and western Asia. In France, these birds are found in southwestern parts. 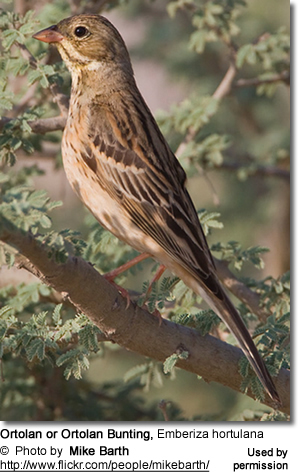 The Ortolans migrate in autumn south to winter in the tropical Africa. They return to their breeding territories at the end of April or beginning of May. 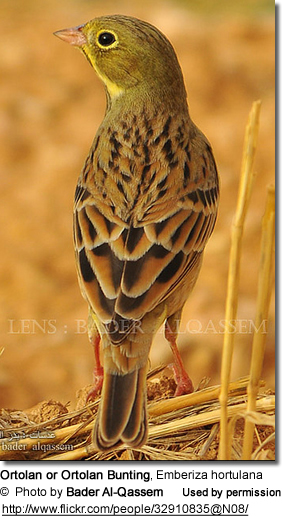 The Ortolans measure about 16 cm in length (including the tail) and weigh 20 to 25 grams. The males have greenish-grey / olive heads, yellowish / beige underparts and heavily streaked brown backs. The females have a much duller plumage and are more streaked on the underside. Their nest is usually placed on or near the ground. 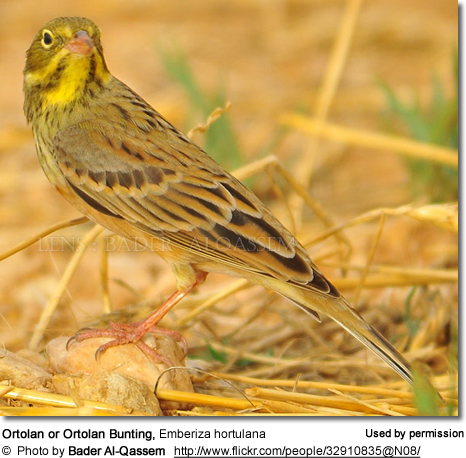 Ortolans mostly feed on seeds, but may also take beetles and other insects, particularly when raising chicks as they need a high percentage of protein in their diet to support their growth. The Ortolan has historically been a popular gourmet dish in the French country cuisine. In fact, the late François Mitterrand - former President of France - requested Ortolans to be served at a grand feast days before his death. This meal included oysters, foie gras and two-ounce ortolans. It is said that Mitterand ate two of these birds. 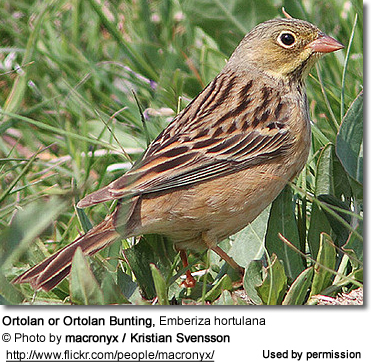 Ortolans used to be netted in great numbers, blinded using a pair of pincers, and kept in small dark boxes. They were force fed to fatten them up until they reached three to four times their normal size. Once they were at the desired weight, they were drowned in French brandy (Armagnac), roasted and then served whole - bones and all.. The proper way of eating this bird was to place the whole bird inside your mouth with only its head sticking out and bite down, until the bird's head fell into a napkin. The most enjoyable moment was said to be when one bit through the Armagnac-filled lungs and stumachs, as the brancy was then released into the mouth. This barbaric cruelty was banned in France in 1999, but it is believed that up to 50,000 Ortolans still were killed each year due to inefficient enforcement of this law. Now the French government imposed a $10,000 fine in order to put an end to it. However, the French are not the only ones serving these birds. 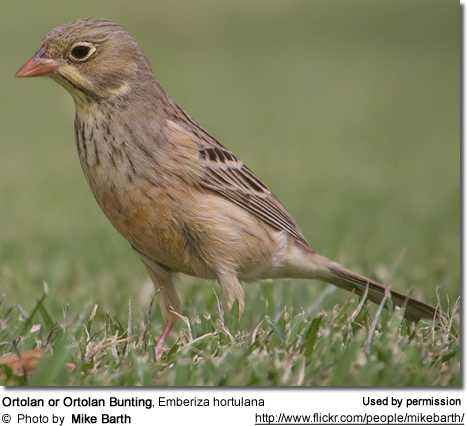 In 2009, a renowned New York chef was said to have served Ortolans as part of a "forbidden feast."